Every standing structure needs a firm foundation. Just think of the Leaning Tower of Pisa—or maybe a home that’s starting to develop cracks in the walls due to foundation damage. Well, you are a standing structure, too, and your feet are no exception to this rule! When your feet alone aren’t able to give you the cushioning and support you need to get through your day without pain, custom orthotics from Family Foot Care & Surgery are often the best way to get you back on stable footing! In a healthy, normal foot, weight and pressure are softened and dispersed relatively evenly as you stand and step. The arch flexes slightly, the feet pronate, and you move forward. Unfortunately, not all feet do this as well as you’d like them to. Sometimes flat arches, joint irregularities, or other problems get in the way of healthy biomechanics—so your feet start hurting a lot sooner and more often than they should. Structural foot problems can even cause pain in the legs and back, too. Remember the house metaphor we started with? If your feet are misaligned, the rest of your body probably will be as well. Instead of fixing your foot structure surgically, the best solution is usually to rebalance the forces across your feet, or even correct faulty biomechanical motion, by wearing special insoles or inserts inside your shoes. Think of it like wearing glasses. Glasses don’t “fix” your eyes, but they allow you to see clearly and comfortably when you wear them. Orthotics operate under the same principle—they allow your feet to function as normally and painlessly as possible, despite whatever structural flaws they may have. 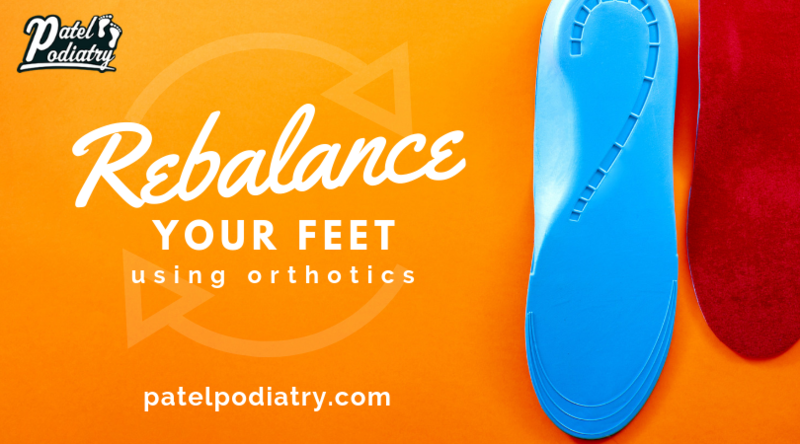 Your orthotics are there to give the arches, heels, and balls of your feet the extra support, cushioning, and stability they may require in order to keep you running, jumping, playing, and working at full speed! Just like a pair of glasses needs to be the correct prescription to do your eyes any good, a person with foot pain needs the right pair of orthotics for them to gain the benefit. After assessing your feet and talking to you about your symptoms, Dr. Patel will provide, fit, or otherwise recommend an appropriate insole that meets the needs of your feet and lifestyle. 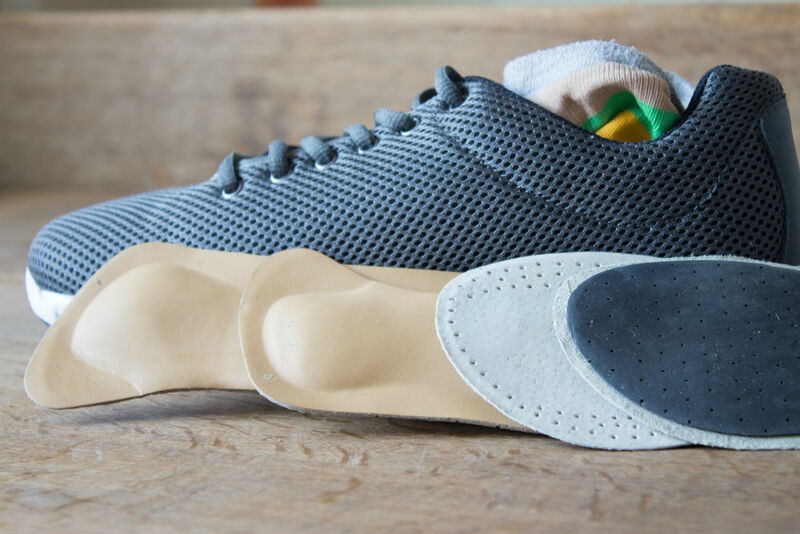 These mass-produced insoles, which can be bought without a prescription, are designed to meet basic needs and alleviate minor foot pain, using relatively average foot sizes and shapes as a guide. Although they are not as good as custom orthotics and typically not as durable, they are cheaper up front and may be appropriate for certain conditions and situations. Remember that not all prefabricated insoles are created equal. If we feel that non-prescription, non-custom orthotics will do the trick, we’ll still take the time to make sure you get a pair that will be the most beneficial for you. Prescription custom orthotics are the superior choice for people with more significant foot pain or deformity, and the only option if you have diagnosed lower limb conditions or motion/stability problems that need to be functionally corrected. Custom orthotics can be accommodative, meaning they “accommodate” an existing foot problem with extra cushioning or support, or functional, meaning they control abnormal joint motion. This gives us a lot of flexibility to meet your needs. A soft accommodative orthotic, for example, might be the best choice for diabetic wounds or arthritis, while a more semi-rigid functional orthotics would be optimal for athletes hoping to prevent sport injuries. We provide a full checkup and diagnosis, then take a mold of your feet in a biomechanically correct position so that orthotics made to your precise specifications can be manufactured at the lab. The type of orthotic and materials used to make them will be selected based on your needs. Custom orthotics are a little more expensive up front, but are also more effective, more durable, and can often be refurbished or adjusted instead of disposed of. A good pair with good care may last years. If you’re struggling with constant foot, ankle, or even leg or back pain and injury, realigning your feet may well be the best solution. You don’t have to limit your activities because of sore feet anymore! For more information or to schedule an appointment with Dr. Patel at Family Foot Care & Surgery, LLC, please give us a call at (203) 876-7736 today.